Getting Robocalls From Point Break Media? 8 Lies They Told. June 27, 2017 Update: They called me again today from 440-209-5739 and have changed their messaging a bit. They now claim they work “with Google” and are saying the listing was “flagged” or “red flagged”. They couldn’t tell me who or what flagged my listing (probably because no such thing exists). They are also now going by just “Point Break” instead of “Point Break Media”, probably because this post and a thread on the forum complaining about them now rank high on Google for “Point Break Media” yet when you search “Point Break”, you get results for a movie/film made in 1991. 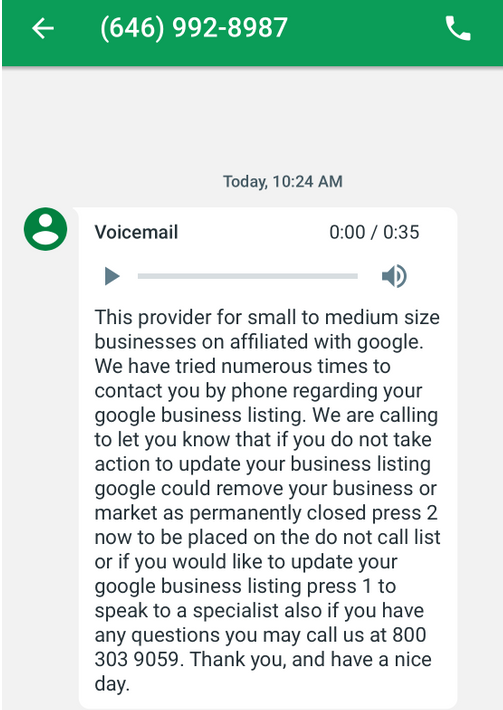 Last week I had the fun experience of getting a robocall from Point Break Media about my Google My Business listing and quickly realized this is the same company that I’ve been seeing floods of complaints about on the forum. If you’ve received a call from these people here is what you need to know. Who is Point Break Media? Unfortunately they are not the company that shows up on Google for a search for “Point Break Media”. That’s right, they are an SEO company that doesn’t show up for their brand name (Note: They do as of this week now that the other company is linking to them). This poor company that shows up first actually changed their contact page recently to clarify they are not the same company that is blowing up your phone with automated calls. I cringed when I saw it as I can only imagine how much their employees have probably been getting slammed with requests due to this. It has to be pretty bad for a company to remove all their own contact details and replace their information with this. As far as the real Point Break Media that is calling you, their site can be found here: http://pointbreakmedia.org/ and their phone number is 866-291-1356 or 800-303-9059 (and probably several others). On their site they state “We are in no way affiliated with Google. We are not a representative of Google or any of it’s companies and affiliates”. They also told me this on the call when I asked if they worked for Google. So, they are telling the truth there. 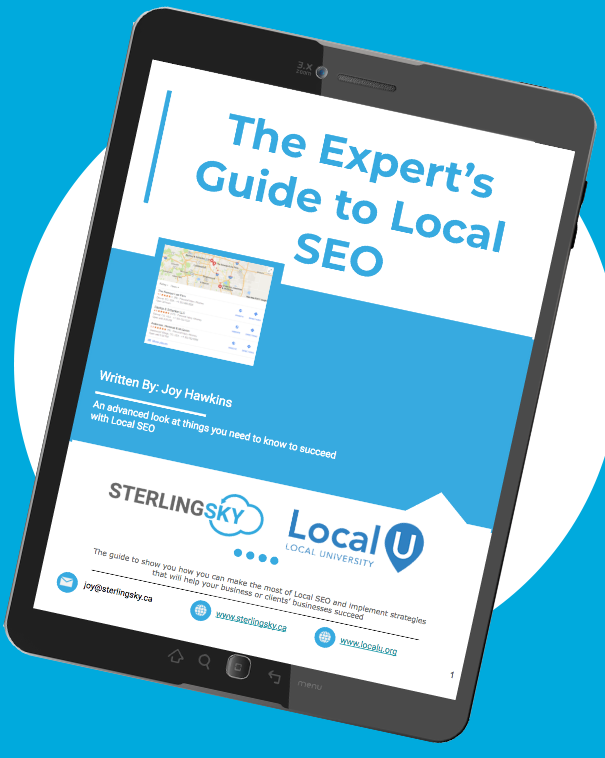 I could not find a listing for them on Google, Yelp, Facebook, Twitter or any 3rd party directory that a Local SEO company would generally be listed on. Their website doesn’t list their address or employees or any other identifiable information that would tell you who they are, other than they’re in Florida. This should instantly send big red flags to anyone looking at it. I would also be a little wary of any company that has a “refunds” tab clearly in their menu (why are so many people wanting refunds?). Their website is a complete replica of http://www.kivanni.com and http://publicbusinessreputation.com/ at the time of writing this. Kivanni Marketing was/is owned by Michael McArdle who is also the CEO at ASAP Tech (Here is a lawsuit against that company). Kivanni Marketing has a few recent complaints on the BBB claiming that they are calling and saying your Google account is compromised (similar to Point Break Media). If Point Break Media isn’t affiliated with Kivanni or Michael McArdle, someone should probably warn him that another company just plagiarized his website including an exact replica of their Terms & Conditions. Ben Fisher over at Steady Demand shared this voicemail with me which was the same automated message I got when they called me. They basically start by claiming “if you do not take action to update your business listing, Google could remove your business or mark it as permanently closed”. So as far as the conversation I had with them, here are the things they told me. Lie #1: Without having your listing verified it is at risk for being removed or closed. Lie #2: We will get you ranked for a 100 mile radius around your office. Some days I really wish this was possible. I have lots of clients who would probably love it if I could get their Google My Business listing to rank for 100 miles away but the reality is that this isn’t possible because your office’s distance to the location the user is searching from and being located in the city the user is searching for are the #1 and #2 ranking factors. This means that if you’re a lawyer in Chicago, paying this company isn’t going to get you listed in Naperville, Joliet, Aurora, & other Chicago suburbs. If you want that kind of exposure, you won’t find it with Google My Business (Hint: Have you tried AdWords?). Lie #3: We can guarantee ranking. Take it straight from Google: Guaranteeing placement on Google is considered deceptive behavior because it’s not possible. Google My Business has lots of ways you can contact them and these aren’t exclusive to people that only make a certain revenue per year. Google My Business is a free service to all small businesses and Google doesn’t offer a service to improve ranking regardless if you make $5,000 a year or $5,000,000. I had to cover my mouth to keep myself from laughing into the phone when the poor sales guy told me this. I actually wrote about how the complete opposite in my article on Moz where I showed that you can’t just delete a listing on Google. The exception would be if it’s spam or never existed, in which case you can request it be removed. Even duplicate listings on Google don’t get removed, they get merged. Google’s objective is to have a list/database of all the businesses that physically exist in a place so why on earth would they just start removing legitimate businesses? It doesn’t even make sense. Google won’t even remove listings for businesses who don’t want a listing if they are in fact located at that specific place. For the next 3 lies, they are not based on my own conversion but one that was recorded on YouTube and I’ve linked to the section of the video for each lie. It sounds like maybe they are writing fake reviews for their customers (how else do you update ratings for a business?) but even if they did that, there is absolutely no way to eliminate the possibility of a business getting a negative review online. Lie #7: You’ll get a list of keywords that nobody else in the world can use. I’m not really sure how this would even make sense. There is not just 1 result when you search on Google, there are thousands. (link to video) If Google relied solely on businesses verifying their listings as the only way to tell if a business is legit, we’d all be in some serious trouble. Google gets information via Google Maps users, 3rd-Party data providers, and other methods to verify whether a business is legit or not. They don’t rely exclusively on the business owner telling them what’s legit or not via the Google My Business dashboard. Have you received a call from Point Break Media? If so, let me know what your experience was like in the comments. Also, check out Google’s guide on how to deal with robocalls that sound like they’re coming from Google. I get these at least twice a week. They’re disgusting in my opinion. I understand people cold calling, but flat out lying and fear mongering is what this is. Haha – lie #5 did for me, too, Joy. Laughed aloud reading that. Oh my! What isn’t funny is that unfortunate folks will believe this stuff. Arghh! The element of the video that caught my attention most was the mention of “editing reviews”. Editing them? Huh! Mike Blumenthal’s ongoing documentation of review spam might need to include a look at what this business is doing. Thanks for taking the time to warn about these scam calls. Shared on Twitter. GROAN… these calls are such a hassle! I just got off the phone with this company. They tried to use some Wolf of Wall Street sales pitch not realizing that I understand SEO optimization but I wasn’t sure if it was actually Google at first so I asked them to email me. When I got the email I immediately googled the company name and checked for them on Twitter. I found this article on twitter and saw the Google Forum complaints while I was still on the phone with them. They actually swore at you? Wow. Glad you did your homework before hiring! I just want to find out who owns it. Then I want to run paid FB ads with his/her home phone asking for calls at all hours to let them know how we feel…. Seriously want to register a complaint with some regulatory agency. I have spoken with multiple agents and opted out with #9 multiple times…..
Here’s a helpful link. File a complaint. The company is located in Boynton Beach. I was hired to work for this company. In the first hour of training I realized how big of a scam they are. The owners walk around in Tank-Tops and shorts. Not like any office I have ever seen. The HR manager actually asked me if I was in a “Recovery program” for drugs. Then I told him I was 100 percent disabled but I did not take any type of narcotic medication and it was mildly inappropriate for him to ask me medical questions. So The company only employs recovering drug addicts. I have contacted the Department of labor for the discrimination complaint. Hey Joe. Thanks for adding your comment. So what’s the real name of the company? I’m guessing you got a pay stub from them but was curious as to what they are actually called since “Point Break Media” doesn’t have a business license in Florida (at least not one I could find). Sorry to hear about your experience with them. Just posted an update at the top of the article. These guys are now just going by “Point Break”. Hey Joy, I never received a check from them. These jerks leave me a message on an almost daily basis. With the verbatim message from above. They are a major reason good Local SEO companies get such a bad rep. I have current clients that call me up yelling at me because I’m “allowing” this to happen. I hate these people and I wish I could punch them in the face. Do you have the street address for their office? Hey Joe, was they guy who asked you that question named Jonathan? The salesman I had was named John, and when I called back no one knew who he was. Thank you for your site here. It’s quite a service. After what’s going on in Washington right now, I’m seriously considering running for President in 2020 if I can get the support to make a campaign viable. I’m not rich. I’m a regular citizen like most of you, which is going to make it that much more difficult. Telemarketing calls are a problem that’s increasingly getting worse. If I am elected, this is definitely an issue that will have my attention because it is too easy for these companies to break the law and get away with it. Just look at this company for example. Some of the people involved have already been sued by the FTC and they went right back to operating again under this new name. I will improve the current laws these companies are supposed to follow and make it easier to take action on companies when they fail to follow the law. It’s still very early in the process, but I’m doing my homework and putting together my thoughts so I can build a campaign website and start the process. It’s time we have someone in Washington who represents everybody, but it’s a long road ahead. Relentless phone calls that I never answered. Finally, after about 20 unanswered calls, the voicemail they left threatened that my listing would be removed from Google–due to the fact that it needed to be “verified” by me. If I didn’t respond, I would lose my google listing altogether. I responded. I’m embarrassed to report that I fell for the scam–but something nagged at me towards the end of the transaction. I immediately took to internet and found this page (thank you!). Within 10 minutes, I phoned my bank, closed my account, reopened a new bank account. All done before damage was done. I can think of a half dozen times in my conversation with these frauds that they suggested that they were working *for* google. They. Are. Not! They actually set up a business profile under my name and left a nasty one-star feedback under it because I made a video where I recorded the call and caught them in their lies. It seems that it went up a few days ago. Now whenever I search my name it comes up with one nasty review on it. The same person who left the bad review on my business profile left a sterling 5-star review for none other than POINT BREAK MEDIA! If they are going to engage in review fraud the least they could do is change the names so that it doesn’t look so obvious. They are a very nasty little group. I was able to claim the listing as my own business and also contacted Google and was able to get them to remove the nasty review as what was said in it was deplorable. Also, some of my own REAL customers have begun leaving me reviews and so that’s helped me out greatly. I really cannot believe that these people would stoop that low as to go ahead and create business listings for people that were brave enough to come out and tell the truth about them in an effort to prevent others from being scammed. I would like to thank you for writing this article, Joy. It shows that you are a person of integrity and that like me, you are not afraid to stand up and try to protect innocent people from being preyed upon by these despicable individuals. BTW, I’m not sure if you were aware, but I am the person who made the video recording of them where they clearly imply that they are representatives of Google. Wow that’s nuts. I didn’t actually make that connection so thanks for clarifying! I loved the video – it was really helpful. Glad to hear that you got Google to restore everything for you. I just had these clowns on the phone for about 10 minutes. Lies upon lies. The girl I spoke to tried to get my info so I tried to get hers. She sounded cute! We both failed. Maybe next time! I unfortunately did agree, as they informed me they were associated with Google and that my listing would be cancelled if I did not sign up with them immediately, along with all the other lies (which I found out afterward). When asked if there was a charge for a Google listing, they said yes (but didn’t mention that it was a charge to them). I immediately phoned my bank, she called them back and stayed on the line to talk to them. Took almost an hour, but in the end the charge was reversed (hopefully it stays reversed). Do not respond to their calls ! ! ! I just got a call from them today and I reported it on the DoNotCall reporting form. We all need to report each and every call so that each time is a count against them at the Federal level. I have had the pleasure in the past of seeing another telemarketing scammer actually go to Federal prison because of fraudulent robocalls like this. I was diligent in reporting and about a year and a half later, I was notified by the DOJ that the people behind it went to trial and ended up in Federal prison. It’s real stuff, so stay vigilant!! Since they call from a different number each time blocking these fools isn’t ever going to work. Has anyone looked in to the possibility of a class action against the company? I unfortunately talked to them and fell for it at first..Long enough to give them account information then before we hung up I said “you know what I need to think about this further so I will call you back and don not run my card. Of course they did and now when I call to talk to “John” to have him credit my account I get the run around …he is in a meeting…they cant find my account information…he even said at one point they would review the sales recording and get back to me asap.. That was 7 days ago. i just hung up with Adam and he promised they would call me by the end of the day. Oh and their website is suspended now. Wendy, how does it appear on your credit card statement? Does it say Point Break or is it under something else? Called then last night and was put on hold for 20 minutes then Adam answered. He said he would have John call me back today after compliance reviewed the audio from my call…blah blah i said i know how this is going to go and he should tell John that all he needs to do is put the money back into my account. No need to review tapes. Because even if you some how mysteriously dont hear me say no to running the $300.00 charge, you’ve still charged me for work that hasn’t and isn’t going to be done because we all know your scammers. Told him my dad was a judge and he loves to fight this kind of crap for fun….He just said ok miss we will call you back.